The Nevada Health Centers brought its mammovan to Vons’ parking lot on Nevada Highway on July 12 to recognize the grocery chain’s $300,000 donation to the mammovan program. 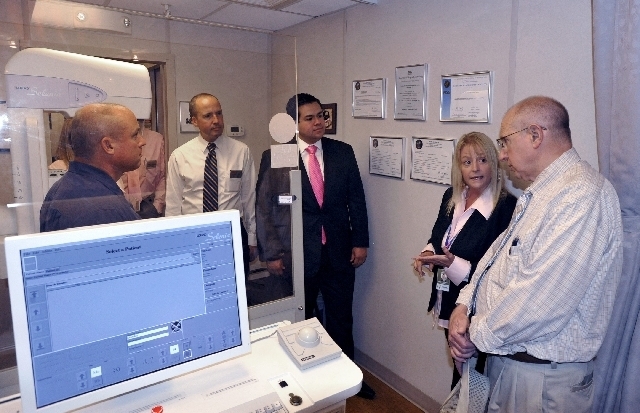 Wendy Wood, the center’s director of operations, discusses the van’s operations with state senator and local doctor Joe Hardy, right, while looking on, from left, is Mayor Roger Tobler, Vons district area manager Tom Nelson, and Vons Foundation Director Carlos Illingworth. The center’s mammovan program is designed to bring mammogram screenings to Nevadans who lack money, insurance or transportation to access a breat-cancer screening.